Have you ever looked at the stars at night and wondered how they got there? I'll tell you how they got there—God created them! 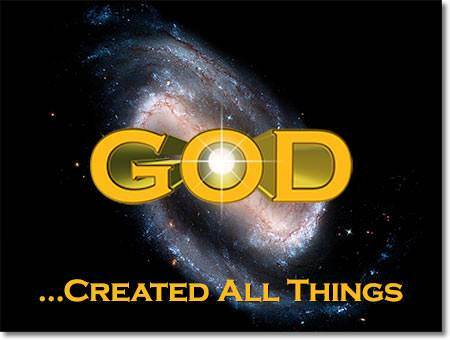 The first book in the Bible tells us that God created all things. The word "create" means to make something out of nothing. Only God can do this. 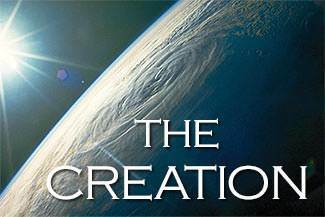 The Bible says, "In the beginning God created the heavens and the earth" (Genesis 1:1). God made the sun, and He made the moon and the sky. He made the stars that twinkle at night. Some of these stars are so large that we could put the earth and the sun inside them and still have plenty of space left! God made this earth on which we live. He made the land and He made the mountains. 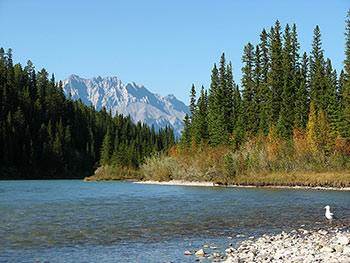 He made the rivers and the lakes and the seas. He made the clouds that bring the rain. He made the grass and the trees and the beautiful flowers. God made the fish that swim in the rivers, lakes and seas. He made many different kinds of fish. He made the tiny goldfish and He made the catfish. He also made the great whale and the dolphin. God made the birds that fly in the sky. God made many different kinds of birds. He made the eagle with his strong claws and He made the pretty little red bird. He made the noisy blue jay and He made the canary which sings so beautifully. He made the funny looking pelican and He made the gentle dove. God made the animals. He made many different kinds of animals that live on the earth. He made the lions that roar in the jungle and He made the little rabbits. He made the mighty elephants and He made the frisky squirrels. He made the horses and the cows and the sheep and the pigs and the goats. God made all of the animals. 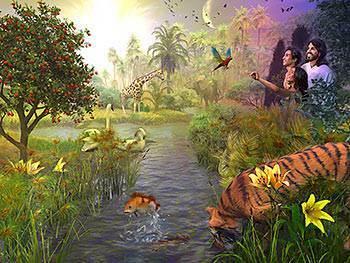 God told the birds, fish, and animals to be fruitful and multiply "after their kind." This meant that every living creature would have babies just like itself. Horses have baby horses. Birds have baby birds. And fish have baby fish. This is true of people also! People have babies like themselves. Every living creature has babies just like itself. It is very important to remember this! We are different from the animals, aren't we? Where did we come from? God made us! 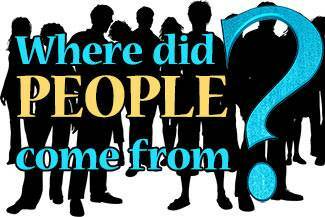 People did not evolve (come) from animals. The Bible says, "the Lord He is God: it is He that has made us" (Psalm 100:3). God created the first man out of the dust of the ground. His name was Adam. God made a beautiful wife for Adam. Her name was Eve. They were created "in the image of God." The Bible says, "God created man in His own image" (Genesis 1:27). The whole human race came from Adam and Eve, the first man and the first woman. Because we are created in the image of God, we are very special creatures. We are also special because we can know God. Animals cannot know God, but you and I can. We can learn about Him in His Word, the Bible. We can love Him. We can talk to Him in prayer. The most wonderful thing about us is this—we were made in such a way that God can live in us. Yes, this is true. God can come and live in our hearts. When God created Adam and Eve, He made a place for them to live. It was a beautiful garden which God Himself had planted. It was filled with delicious fruit of all kinds. A river of pure water flowed through the garden. Adam and Eve had everything they needed to make them happy. The best thing of all was this—God Himself came down each day to visit Adam and Eve. Every day God came to walk and to talk with them. How happy they were! When God finished creating everything, He looked at all that He had made and saw that it was "very good." God was pleased with His beautiful creation. "You are worthy, O Lord, to receive glory and honor and power: for You have created all things, and for Your pleasure they are and were created" (Revelation 4:11). Now I want to ask you a question. Of all the great and wonderful things which God created, what do you think He loves most of all? He loves people most of all! God is so great that He knows each one of us. He knows you and He loves you. You are worth more to God than the whole world. Isn't that wonderful! God showed His love for you by giving His Son to die on the cross for your sins. God gave Jesus to you to be your Savior and your special Best Friend. Maria wanted to be one of the singers going to the retirement home where her grandmother lives. When her name was not on her teacher's list of those going, she tore up the list. Then Maria lied to her teacher. All day Monday, Maria watched Miss Wilson and wondered if she had missed the list yet. Just before school let out Miss Wilson said, "Did anyone see a pink slip of paper? It was a list of those who are to sing at the retirement home on Friday." As Miss Wilson paused, Maria felt as if everyone was looking at her. She kept her eyes on her book and scarcely breathed. At last Miss Wilson said, "Well, I have made another list and I want to check it. Please stand up as I call your name." One by one, each member of the group stood as their names were called. "Even my friend Susan Blake is going. Why not me?" 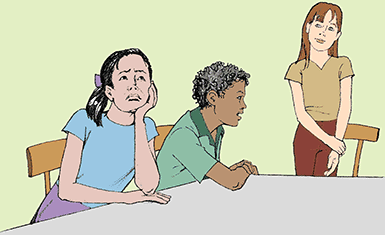 Maria thought crossly as a pale, thin little girl stood up. "I think I can sing just as well as she can. And I would wear nicer clothes and look better, too." On the way home Maria's feet dragged. Her mind was busy trying to think of a way she could go with the group on Friday so she could see her grandmother. As she reached the house, Steven popped his head out of the garage door. "Maria, come here," he called. "Look at what I have." 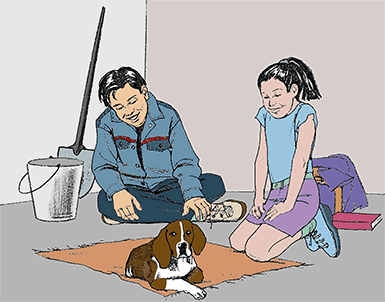 He pointed to a small puppy curled up on an old rug in the corner of the garage. "Oh, he is so cute!" Maria cried, falling down beside the brown and white puppy. "Watch out!" Steven warned. "His foot is hurt. Don't pick him up." "Where did you get him?" Maria asked, gently smoothing the puppy's head. "I was coming down Main Street," Steven's words tumbled out with excitement. "A car passed me. Then it slowed down. I thought they wanted to ask me a question or something. But they just opened the car window and dropped this puppy out. Then they roared away. The puppy yelped and rolled over so I ran and picked him up. I am going to keep him. I know we will take good care of him. I have decided to call him Captain." "Yes, of course," Maria agreed. "I think 'Captain' is a great name. Do you think he feels badly because he was not wanted, Steven?" Steven nodded. "I guess so. But we will show him that we want him. He will soon forget them." Maria laid a soft finger on the hurt paw. "Poor little Captain," she said. "I am so glad they did not kill you, but I do not suppose dogs can get their names in Jesus' Book and go to Heaven." Steven sat back on his heels and stared at Maria. "WHAT are you talking about?" he asked. Maria explained about the lesson she had heard on Sunday. "But I do not think Jesus will write my name there," she finished sadly. "Why not?" Steven wanted to know. "Oh, just because," Maria answered. Then she quickly changed the subject and said, "Steven, we could take Captain across the park to Mr. Warren's. He might fix Captain's foot. He made Billy's cat better, remember?" Steven grinned. "Hey! That is a good idea." Maria helped Steven cuddle the puppy in his arms. "Come on, Captain, we are going to get you all fixed up," he said to the whimpering little dog. Mr. Warren welcomed Maria and Steven with a smile. 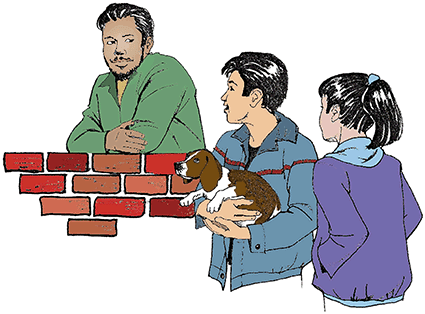 They both felt better when he told them the puppy's foot was only slightly sprained. "This pup will soon be chasing squirrels again," Mr. Warren said, chuckling. "Right now though, he wants you to comfort him. I am glad you are kind to animals. God gave them into our care you know. But some people do not treat them very well." Maria moved closer. "Mr. Warren," she asked softly, "are dogs different from people? On the inside I mean?" Mr. Warren nodded. "Yes, Maria. God made the animals and the birds and the fish in the sea. But animals are different on the inside because they cannot know God. God made us with a special place in our heart. He did this so we could get to know Him and love Him. God wants us to talk to Him—that is called prayer." "Aw, I think God is too busy for that," Steven said, holding out his arms for Captain. "What do you mean, son?" Mr. Warren asked quietly. "Well—," Steven hesitated. "Most of the time our parents are too busy to bother with us. I just thought God was like that too." Mr. Warren looked sad for a minute, then he said, "No, children. God is not too busy. He loves you both very much. He sent His Son, the Lord Jesus to die on the cross for you so you could come to know Him in a personal way. God wants you to take Jesus as your Savior. Then you can talk to Him and tell Him all your troubles." Maria felt a lump rise up in her throat. With all of her heart she wanted to belong to Jesus and get her name in His book. "If only I had not told that lie!" she thought to herself. What will Maria do? Will Maria take Jesus as her Savior? Will she get to sing in the school group? Don't miss the next exciting chapter!